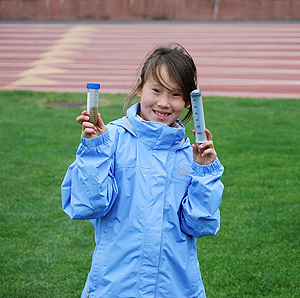 Third-grader Claire Dworsky brought her water samples to Adina Paytan's lab at UCSC for analysis. Photo courtesy of Jim Metzner. 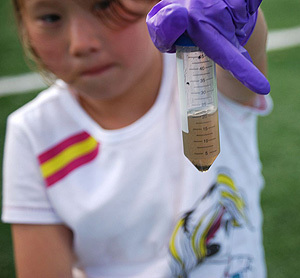 Dworsky collected water samples from 10 soccer fields in San Francisco. Photo by Deanna Hodgin. Paytan taught Dworsky how to collect samples for the study. Photo courtesy of Jim Metzner. A water sample from artificial turf contains particles of the crumb rubber used as fill to keep the plastic blades upright. Photo by Deanna Hodgin. 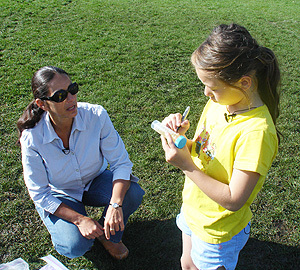 Marine scientist Adina Paytan has a new collaborator: third-grader Claire Dworsky of San Francisco, whose winning entry in the Kids' Science Challenge competition earned her the chance to investigate her own questions about water quality in Paytan's laboratory at UC Santa Cruz. An avid soccer player, Dworsky was curious about the differences between grass fields and artificial turf with respect to pollutants in the water that runs off the fields. Paytan said it was easy to pick her entry as a winner. "Her idea stemmed from genuine curiosity and observation," said Paytan, an associate research scientist in the Institute of Marine Sciences at UCSC. 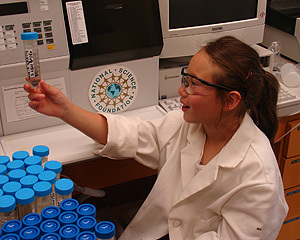 The Kids' Science Challenge is a nationwide competition for kids in grades 3 to 6 who were invited to submit experiments and problems for a select group of scientists and engineers to solve. This is the first year of the competition, which is funded by the National Science Foundation and created by Jim Metzner, producer of the Pulse of the Planet radio program. In an interview with Metzner, Dworsky explained how she got interested in the runoff from soccer fields. "I look down and I see that the turf water compared with the grass water looks different, so that's why I'm trying to figure out what's going on...if turf fields pollute more than grass fields," she said. Paytan has been involved in the Kids' Science Challenge since last year as an expert on water quality, one of four categories in the competition. She worked with local high school students to produce a promotional video for the program's web site, and she has spent many hours answering questions from children around the country in live online sessions. "It has been a delight to work with Dr. Paytan, who continues to inspire Claire and the thousands of other kids who have visited kidsciencechallenge.com," Metzner said. Paytan's own research addresses a wide range of questions involving the global systems that affect ocean productivity, seawater chemistry, nutrient cycles, and water pollution. She also devotes a lot of time to science education and outreach efforts, such as the Kids' Science Challenge. "Part of our job as scientists is to communicate what we know to the general public. If we just talk to other scientists, the impacts are not as significant," she said. After Dworsky's entry was chosen as a winner in March, Paytan discussed the project with her and sent her a package with supplies and instructions for collecting water samples. Dworsky collected 110 samples from 10 soccer fields in San Francisco, half with grass and half with artificial turf. She has made several trips to Paytan's lab at UCSC, where the samples will be analyzed, and will spend more time there over the summer. Paytan said the results of the study should be available by August. After meeting Dworsky and starting to work on the project with her, Paytan said she continues to be impressed by her 8-year-old collaborator. "Obviously, her science background is not like a college student's, but she observes and asks good questions," Paytan said. "She's a smart kid, and she wants to take it to the next step. Beyond the science question, she's also interested in the decision-making process when communities decide to replace grass fields with artificial turf." The issue has been controversial in some communities. According to Paytan, there are advantages and disadvantages to both types of fields. Dworsky's investigation of runoff from grass and artificial turf won't resolve all the controversies, but it will address an issue that has not been well studied. Paytan said a search of the scientific literature did not turn up any prior studies like the one they are doing now. "I couldn't find anything in the peer-reviewed journals that's comparable. No one has done an extensive comparison study of fields in the same city to look at what's coming off in the runoff," she said. "It just shows that a little girl can do something that's useful for everybody."